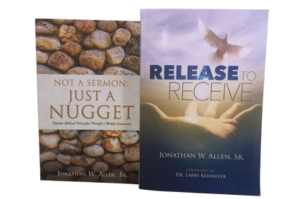 Contact | Jonathan W. Allen, Sr. Please complete the information below to request Jonathan Allen, Sr. to speak to your organization, business group, conference, or church. Book discussions & signings are also available upon request, subject to Mr. Allen’s availability. For best results, please provide your request 30 days prior to the event date. Whatever you refuse to release, restricts your progress and retards your growth. When will you release what holds you back, so you can receive the new thing God has for your future?